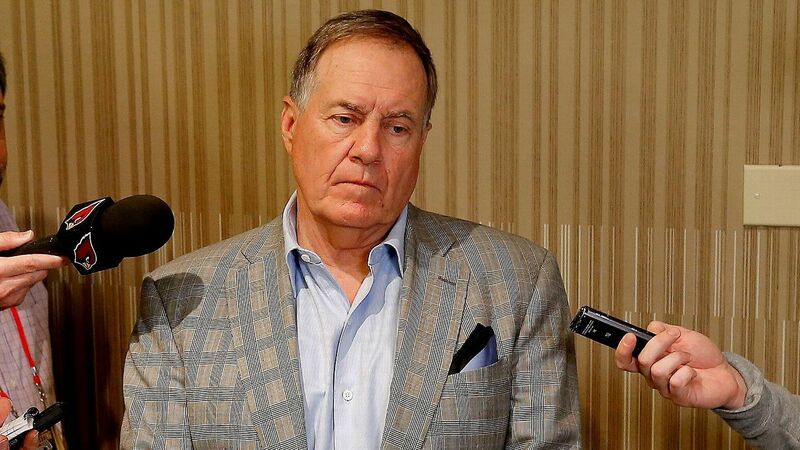 PHOENIX — New England Patriots coach Bill Belichick met with reporters on Tuesday at the annual coaches breakfast during the NFL owners meetings, and Jeff Howe of The Athletic tweeted a unique breakdown of how it unfolded. Bill Belichick fielded 116 questions over 43 minutes this morning (2.7 questions per minute). He said 1,790 words, an average of 15.4 per response. His most frequent phrases were “we’ll see” (21 times) and “I don’t know” (13 times). Question: How will the acquisition of defensive end Michael Bennett help the team? What he means: I wasn’t investing a $6 million base salary in him this year without having an idea of how he will help — as a tough, physical end-of-the-line defender in certain packages who can reduce inside as a sub-rusher. But I’ll keep that to myself because there’s no need to advertise that to our opponents right now. Question: Has the onside kick become a noncompetitive play, and does that contribute to your thoughts on the proposal that would allow a fourth-and-15 play instead? What he means: I’m happy to share my unfiltered thoughts with my fellow coaches. Reporters? No thanks. Question: A follow-up on Michael Bennett, whom you were complimentary of prior to Super Bowl XLIX. Is he still the same player? What he means: Good try. You already asked me that. Question: What made tight end Matt LaCosse a worthwhile pursuit as a free agent? What he means: He played well against us in the 2017 preseason finale when he was with the Giants (5 catches, 60 yards, 2 TDs). I’ve had my eye on him since he was a young, developing player. Question: How is Isaiah Wynn‘s recovery going? What he means: Things seem to be promising, but I don’t talk about injuries publicly. Question: Do you have any input on the onside kick proposal? What he means: Come on, man! I already (non) answered that. Try to pay better attention, please. Question: Why is it your preference to have every play allowed to be reviewed (including pass interference)? What he means: I’m not getting into any rules topics with the media, but you haven’t seemed to have figured that out, yet. Question: What did you think outside linebacker John Simon brought to the team last year that led you to re-sign him? What he means: He was a valuable contributor for us in a variety of roles and a priority to re-sign. But I’m not going through a detailed personnel report here at breakfast. Question: Brandon Bolden and Terrence Brooks are good special-teams players signed by the team as free agents. Was improving the coverage units a top priority? Question: Would you say 2018 seventh-round pick Ryan Izzo‘s strong suit at tight end is his blocking? What he means: He flashed enough promise as a rookie to make the initial 53-man roster before we moved him to injured reserve. We obviously think there’s something to work with there. Question: Have you seen Michael Bennett play some of the techniques he projects to play in New England? Those seem like considerably different schemes he’s played in. What he means: Another Bennett question? I already answered two of them before. We’ll see if you’re smart enough to figure out I’m not going to answer them. Question: With all the young players who were on IR last year, what do you look for to gauge their progress? What he means: A few of our six draft picks from last year who landed on IR will hopefully find a way to carve out roles. If not, that means we didn’t have a good draft. Question: What did you see from 2018 sixth-round pick Braxton Berrios last offseason before he went on IR? What he means: He needs to stay healthy so we can evaluate him. That uncertainty contributed to our heavy pursuit of free-agent slot receiver Adam Humphries this year. Question: Do you feel instant replay is possibly heading in the right direction by expanding it to review for pass-interference penalties? What he means: Already answered this one earlier. So I’m going to say we’ll see twice for effect. Question: [Saints coach] Sean Payton said the competition (committee) has agreed to put out a proposal to allow a challenge for a play that wasn’t called as pass interference, which would address the play in the NFC Championship Game. Are you in favor of that? What he means: Repeat question again. So a repeat we’ll see is what you get — again. Question: With free-agent wide receiver Bruce Ellington, does his experience in systems similar to yours give you an idea of how he might fit with you? What he means: We’re light on the wide receiver depth chart — which you seem to write about every day — and he was available. So let’s not over-analyze it. Morgan Rielly – Norris Trophy Winner?